A comprehensive, 8-part guide to learn everything you need to find, install, and maintain the backyard oasis you've always wanted. You’ve been trying to find a solution to about 3 or 4 different problems – spending more time as a family, possibly keeping your kids (or grandkids) active and off the couch, finding a way to relax and unwind yourself, or maybe even a way to exercise – and think a new backyard pool may solve them all with one fell swoop. But now where do you go? The thought of pool shopping is fairly overwhelming itself, so we are hoping to help you through the process. I have personally found information on purchasing swimming pools to be ‘spotty’ at best, so I’m hopeful this information can help guide you to make the best purchasing decision for you and your family. Bonus: Get This Guide in a 20+ Page PDF With Recommendations for Planning, Cost, Installation & More! Understand the pros and cons of each major type so you can be confident in the pool you ultimately purchase. The sheer variety of swimming pools available today is amazing. It can be a bit much at times, but with the various options available, there is sure to be one that fits your needs and budget. The most important thing is to understand the pros and cons of each one so you can be confident in the pool you ultimately purchase. Inflatable pools that you find in big box stores are a great option for small kids or if you rent and cannot make any significant changes to your property. They generally have a ring around the top that inflates and allows the wall of the pool to rise as you fill it with water. These pools are similar to the traditional above ground pools discussed above, however, they will have fully insulated wall panels that are significantly stronger to combat the ground forces pushing in on the walls. These pools will come in a variety of sizes, even the more ‘free form’ look. These are pools you typically find in your specialty pool stores and are a great option for any age range. They consist of a steel or aluminum wall, resin or metal posts and top ledge to add support, a vinyl liner and a pump and filter system. They are round or oval in shape and vary in size from 12’ to 33’ in diameter. Most of these pools are between 48” – 54” deep. There are 3 types of in-ground pools: vinyl, fiberglass and concrete. I’m not going to spend a lot of time discussing them, as they are in a whole different category, and River Pools & Spas pretty much has the best information out there on inground pools. 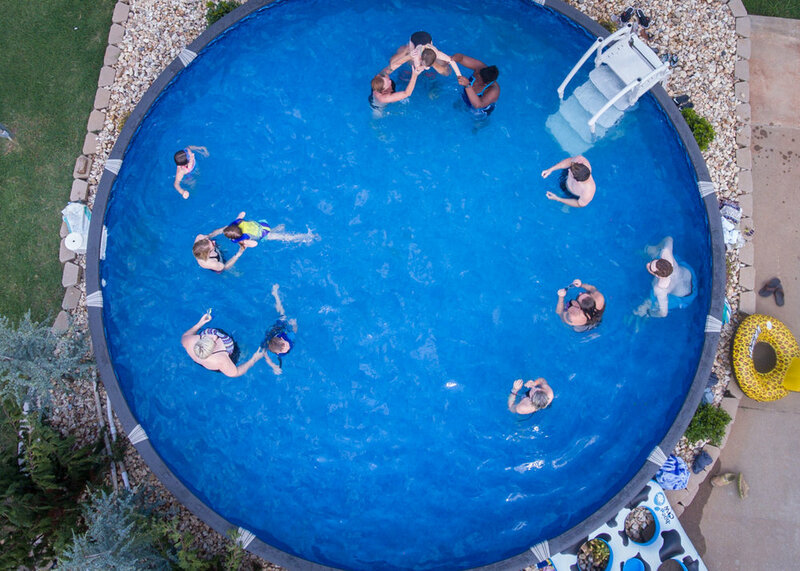 They specialize in fiberglass pools, but have in depth discussion surrounding all types of inground pools and pros and cons for each type. Our goal is to be the most educational company regarding the traditional above ground pool discussed above. We have found that inground pools have quite a bit of discussion surrounding them, but no one has really gone in depth on above ground pools. We hope to ‘clear the air’ on above ground pools, and answer any and all questions you might have. Throughout our site, we will be as transparent as possible – explaining the industry in general, and how we apply it to our product selection. And, why we have chosen the product line-up we have. Assuming you’ve narrowed down your choice to a traditional above ground pool, there are a few things to think about before heading out to shop. Assuming you’ve narrowed down your choice to a traditional above ground pool, there are a few things to think about before heading out to shop. Taking some time up front to do a bit of initial planning for your above ground pool will help you begin narrowing down some of the options. You want to first make sure you have sufficient room for the pool in your backyard – make sure you understand any city easements that may be in place and if you have any utility lines running through your backyard. You need to avoid these areas, or in some cases, utility lines can be moved out of the way. You also want to ensure there are no overhead power lines. You should never install a pool under any overhead lines. Once you have determined an area that is clear, you can figure out the largest size pool that will fit. Generally, above ground pools come in the following sizes: 12’, 15’, 18’, 21’, 24’, 27’, 30’ & 33’. There are also a variety of oval sizes if your area will not allow for a round pool. Country Leisure Tip: Stick with a round pool if at all possible. They are superior when it comes to the strength of the wall, as the water pressure is equal on all points of the pool; whereas an oval pool has unequal water pressure on the rounded ends (there’s a more in depth physics discussion that can go on here, but who wants to hear about that??). Due to the unequal water pressure, oval pools will require additional bracing for support, which causes them to be more expensive than round pools. Added bonus – a round pool will hold more water! If you have a larger area and can be selective on location, definitely consider the proximity to your electrical breaker box. You can’t run your pump and filter on an extension cord, so you will need a permanent electrical service ran out to your pool location. It’s also nice to place the pool away from trees – this just aids in keeping the pool clean, as leaves won’t be accumulating. And, to minimize the excavation, select the flattest area in your yard. The next consideration is the material you would like the pool constructed from. There are 3 options in above ground pools – all metal, hybrid, and all resin. All three options will have a metal wall and vinyl liner – the options come when you are looking at the top ledge, posts and caps. The all metal option consists of metal top ledge, posts and caps. The all resin option the same. The hybrid option will be a combo of metal and resin – for example, the pool may have metal posts and resin top ledge and caps, or resin posts and top ledge and metal caps. Generally, the overall look of the pool is what the buying decision tends to be made on – some have cleaner, more modern lines and appearance, while others have a more traditional look. It's one of our most commonly asked questions: "What's the final pricetag?" The actual pool will cost approximately $1,700 for an all metal 18’ pool and go up to $7,500 for an all resin 33’ pool. You will find the all metal pools to be the most inexpensive option, while the all resin pool will be the most expensive pool kit. If there is a hybrid pool option, it will be priced somewhere in between a metal and resin pool kit. BONUS: If you have ever wanted to see an above ground pool kit be manufactured, here is a great video that gives a high level overview of the process. Note that installation in Oklahoma has a few differences than what is shown on the video. Above ground pool liners will range in pricing depending on their thickness and how they attach to the pool wall. Common liner thicknesses are 18 - 25 mil, and the liner will either ‘overlap’ the pool wall or will attach to the top track of the pool (referred to as a beaded liner). Pricing for the pool liner ranges from $100 - $1,000 depending on thickness, type (overlap or beaded), and the size of your pool. Entry level liners will be a plain blue overlap style. Next will be printed bottom overlap liner, and then a full print overlap liner. Finally, you have beaded liners which fluctuate in price simply based on their thickness, as they come in full print options only. Your above ground pool pump & sand filter will be the next component of the pricing and will depend on the size of pump and filter (commonly referred to as the ‘system’) needed. You will find that both 1 speed and 2 speed pumps can be used, with 2 speed pumps being the more expensive option. The 2 speed pump simply allows for the flexibility of a high and low setting, allowing the pump to remain on 24 hours / day on low, and generates some energy efficiency. Additionally, you will see 0.5 hp pumps up to 2 hp pumps being offered. The sand filter size will be based on the size of your pool – common sizes in the industry are 100#, 300# and 400# sand filters. Your pool retailer will generally have a standard option of pump that is put with their pool kit, but you can always ask to upgrade if you would like a different pump for your pool. There is no upgrade to the sand filter – it is strictly based on the size of your pool. Depending on your retailer, you may have the option to upgrade the filter media that is used in your filter. Sand is common, but there are other options, such as glass filter media. The glass filter media is more expensive than the sand, but does have pros – the main one – it doesn’t ever need to be replaced, whereas your sand will need to be replaced at some point over the life of your filter, generally every 3-5 years. The final component common to an above ground pool kit is the ladder or entry system. You will find an A-frame ladder will be the go-to choice for most retailers. These are very cost effective and work great on above ground pools. If you would like something a bit more substantial, you can generally upgrade to an ‘entry system’, which will include steps that go down on the inside of the pool and additionally handrails to assist with entry and exit from the pool. If you plan to install a wood deck around your pool, there are also deck mount options for the ladders that allow for a seamless transition from the deck to the ladder or entry system. Upgrade options on above ground pools will vary greatly by retailer and what product lines they carry. For the most part, you will have the option to add on a salt or ozone sanitizer to your pool, a hard bottom if you prefer, upgraded ladder & entry systems, and automatic or robotic vacuums. These are all a personal preference and generally make maintenance of the pool easy for you, but are not vital. Above ground pools have a wide variety of accessories – most commonly are the toys, basketball goals, floating coolers, etc. Above ground pools have a wide variety of accessories – most commonly are the toys, basketball goals, floating coolers, etc. These fun accessories are really self-explanatory, so we aren’t going to spend a lot of time on them. There are a lot of accessories that can actually make your life easier as far as maintaining your above ground pool (and most can help if you have an inground pool as well). In most cases, you will be provided with basic maintenance equipment (backwash hose, telepole, leaf net, & manual vacuum) when you purchase your pool, but it’s important to know there are variations of this equipment and differing levels of these tools. Once your pool is installed and you start to see what you need help with, then you can upgrade or add to your equipment. For example, if leaves are a problem in keeping your pool clean, there are specifically designed leaf vacuums and even a bracket & net you can install on your wall that will collect the leaves before they drop to the bottom. This will help prevent algae from having something to bloom on and you winding up with a bright green pool. On the vacuum heads, you will discover there is a wide variety to choose from. There are different vacuum heads you can upgrade to that will cover more surface area as you vacuum, or ones that will brush the pool floor as you vacuum, helping you collect more of the fine dirt/dust from the bottom. If the thought of vacuuming anything else around your home makes you cringe, there are robotic vacuums that are essentially a self-contained unit. You simply plug them in and turn them on and they will vacuum the pool while you are at work or sleeping at night – very similar to a Roomba! Lastly, there are a variety of options on chemical maintenance accessories, including floating chlorine dispensers, and even automated water testing units that constantly monitor your water chemistry and text you when you need to adjust. Some will even give you the exact measurements of the necessary chemical to be added. The installation of an above ground pool can generally be completed by an experienced pool installation crew in about 4-6 hours. Install of an above ground pool can most definitely be a DIY project if you choose, or most pool retailers will have either in-house installers or a list of contractors that you can contact to install your pool for you. Depending on the size of your pool, the extent of excavation work to be performed, and your location, installation will start around $750 and go up from there. Video is sped up considerably. Actual time elapsed was about 2 1/2 hours. After the pool is filled, there will be a bit of work to be done before the pool is complete. You will want to ensure a layer of dirt is built up around the outer edge of the pool and is compacted (this is known as the pool ‘berm). This is achieved by simply walking around the edge of the pool once it is filled and ‘stomping’ the dirt down. A solid berm helps contain any grass or weeds, and keep them outside of the pool. It will also work to prevent washout underneath your pool in the case of heavy rains. If your pool was installed on a slope and the installation crew excavated into a hill to prepare a level site, there will generally be a trench left between the pool wall and the hill. Once the pool is full, you will want to ensure the trench is filled back in and is compacted – this will also prevent your pool bottom from washing out. The water inside the pool is what gives the wall its strength, so you want to ensure your pool is full and the wall is solid before completing this step. The weight of the water in the pool will help to compact the sand bottom underneath the liner. Generally it takes 5-10 days for the sand to be fully compacted and become hardened. The first time you get in the pool to swim, gently feel the bottom of the pool to ensure the sand is sufficiently compacted. If the bottom is still soft, give it a few more days before walking around on the bottom. ***Country Leisure Pro Tip: Leaving footprints in the bottom of the pool will make it extremely difficult to vacuum your pool – don’t rush this step! This seems to be the part of pool ownership that worries people the most, but if you stick to a weekly routine, swimming pool water maintenance can be very easy. You will want to test your water at least weekly. There are a variety of different test kits available. They include strips that you simply dunk in the water to get your water readings, drop kits, and even completely automated systems that will continuously monitor your water and alert you if anything needs to be added. Some pool retailers will have a water lab that can test your water for you as well. On a monthly basis, you will want to test copper (only if you are using a copper based sanitizer like Pure ‘N Blue or Pristine Blue), water hardness and cyanuric acid levels, and ensure these are within the appropriate range. The most common water issues with above ground pools are green water and/or cloudy water. Green pool water indicates algae, and generally requires the water to be shocked with a high dose of sanitizer (chlorine or bromine). Cloudy water can be caused by many factors – commonly we see it after shocking a pool. The dead algae that is not caught by the filter tends to hang out in the water. In these cases, you will want to ‘floc’ the pool. This process causes the algae or other contaminants that are in suspension in the pool water to sink to the bottom, allowing you the ability to vacuum them out. General maintenance on an above ground pool is fairly minimal, and if you spend a bit of time each week on these items, you can prevent a lot of the most common pool problems. A few other items to be familiar with are the pump and the multiport valve. If you have a 2 speed pump, you will note a low setting and a high setting. The low setting pulls 4.4 amps and can be run 24 hours a day, seven days a week. Running your pump on low for continuous filtration will provide the best water conditions, as the filter is constantly cleaning the water. This will lead to less headaches for you, the homeowner, related to water care. The multiport valve on top of the sand filter has five to seven settings depending on the model and brand, and it is important to understand what each one does. Make sure you turn your pump OFF before moving the handle to change settings to avoid damage to your equipment. Filter Setting – this is the most common setting. Filter helps remove any contaminants from your water by catching them in the sand filter tank. Waste Setting – this is used to remove water from your pool by bypassing the sand filter. This is very useful when opening your pool or anytime the water becomes very dirty – you can vacuum the water/debris straight out of your pool without contaminating your sand filter. Backwash Setting – this is the setting used to backwash your sand filter. This cleans out anything the sand has trapped while filtering your pool water and relieves built up pressure in your sand filter tank. Rinse Setting – you will use the Rinse setting after you backwash your filter in order to clean out the multiport valve and reset the sand in your filter. Closed Setting – this completely turns the multiport valve off, not allowing any water flow to your sand filter. Winterize Setting – this is for use during the off season when the pool is not in use. Recirculate Setting – this bypasses the sand filter and pushes the water back into the pool without filtering it. Periodically you will need to change out the sand in your sand filter for the best filtration results. The frequency of vacuuming really depends on your surroundings– some of you will need to vacuum more frequently than others. If you have no trees around your pool, you may be able to get away with only vacuuming 1 – 2x / month. On the other hand, if you have a lot of trees around your pool, weekly vacuuming might be a necessity. You will have an automatic vacuum or a manual vacuum generally included with your above ground pool purchase. The automatic vacuums are handy and convenient, but manual vacuuming is best when you have a buildup of debris and/or sludge on the bottom of your pool (usually at opening). Vacuuming to ‘waste’ as discussed above, is the best option in these instances to keep the debris and sludge out of your sand filter. Sometimes, above ground pool warranties can be a bit tricky and cumbersome. Let's break it down together part-by-part (literally). Above ground pool warranties can be a bit tricky and cumbersome. This is simply because all the components do not come from the same manufacturer. You will have a manufacturer warranty related to the actual pool (this includes the wall, bottom track, top track, ledge, posts & top caps), a manufacturer warranty related to the above ground pool liner, and another warranty for the pump & filter system. Each of these warranties will have different warranty periods and they will all have items that will void the manufacturer warranty. Some retailers may even add additional warranty on the individual items that they honor internally as well – to simply back up the manufacturer warranty. Some of the most common reasons warranties are voided are running the pump on an extension cord for a prolonged period (more than a week), and gophers or pool maintenance equipment tearing a hole in the liner. When you are shopping for an above ground pool, ask your retailer if they will assist you with navigating the warranty. You can most definitely navigate the warranty on your own with the manufacturer, but sometimes the convenience and peace of mind that comes along with knowing the warranty will be upheld is worth paying a bit more for. Retailers that have experience with the manufacturers’ and how the warranty works will most generally resolve the issue up front and get reimbursement from the manufacturer, allowing you more useable time with your pool. Common services related to above ground pools generally include opening your pool, closing your pool, cleaning & maintenance, patching a hole in your liner, changing out filter sand, reworking the bottom floor sand, and changing out pumps. These are all relatively straight forward and can either be handled as a weekend DIY project, or a service technician can take care of it while you are at work – whichever you prefer. Once you’ve made the decision to purchase an above ground pool, the process becomes fairly easy – even something that can be accomplished without ever visiting the store if you prefer. Your sales associate, whether in person, via email, or via phone, will walk through any last questions you may have and then will simply get the information from you regarding the pool model and size you would like and any accessories or upgrades you would like to add on with the initial purchase. They will get information from you concerning your location and site for installation so they can add in installation costs and estimated excavation costs (if applicable), assuming you choose to have the pool installed by one of their installation crews. From this point, the next person you will most likely hear from is the individual responsible for scheduling the pool installation – they will either be calling to set up an installation date/time or to confirm the installation time if one was set at the time of your pool purchase. Now you are in the hands of the installation crew. While that crew is on site doing the installation, they will walk through the pool and the steps you need to complete once the pool is full, and you can ask any questions that you may have. Financing is a good option when purchasing an above ground pool– it's relatively easy to do. The application process is easy and most can be done online; there is even a pre-approval process that can be completed in most cases if you would like your application submitted to know what ‘buying power’ you currently have. Ready to pick the perfect Above Ground pool for you? Check out our models here. Want to talk with a pool expert about the right pool for you? Let's chat soon! Hopefully, the information provided throughout this above ground pool buying guide has helped you understand more about the options available to you and answered your questions. We have compiled a few of our most frequently asked questions below just in case …. What’s a popular size pool that is big enough to feel like a ‘big pool’, but not too expensive? 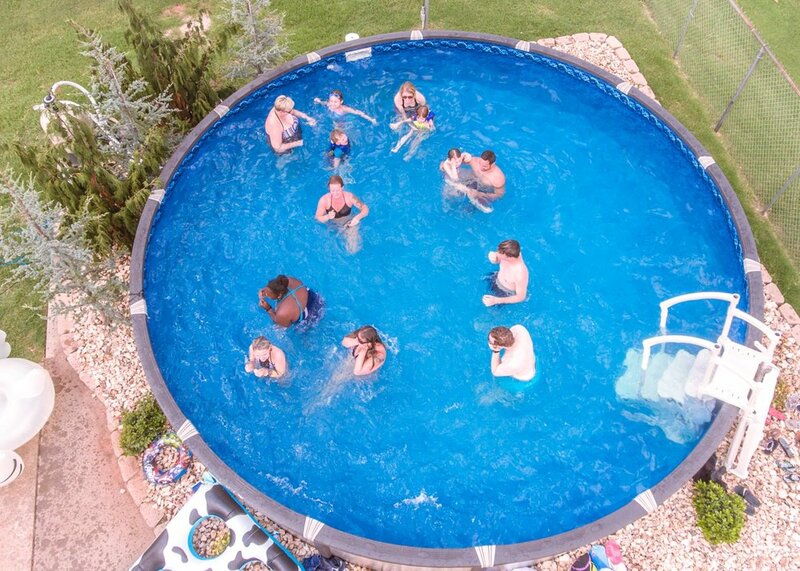 A 24’ pool is the most popular size we sell at our store – see the photo for reference. You can easily fit multiple families or host birthday parties with floats and toys spread out without feeling too cramped. It is in the mid-range of the pricing spectrum, so you get plenty of room without breaking the bank. How many years will an above ground pool typically last with Oklahoma weather? If properly maintained, an above ground pool can easily last 15-20 years. With Oklahoma storm season, there is always the threat of severe weather – for hail or strong winds, we can generally provide replacement parts or help re-establish your wall or liner if they sustain storm damage – with the exception of a tornado completely relocating your pool, most storm damage can be resolved without replacing the entire pool. Will you come out and help me choose the right spot for my pool? Yes, we offer free site checks to help you find the best location for your new pool, as well as measuring your space so you know what size pools will fit in your yard. A site check will also help you understand any excavation that may be necessary if you have a heavily sloped yard. How much is maintenance going to cost each year? If you maintain your pool water, perform weekly water testing/balancing, and perform the suggested weekly cleaning routines, you can expect to pay between $250 - $500 for chemicals and maintenance each season (depending on the size of your pool – approximately $250 for an 18’ pool and $500 for a 33’ pool). This range assumes no major water issues, like a large algae bloom.